"The most surprising words trip spellers up," Kimble said. "I thought something was going to surprise us here, but it never happened." 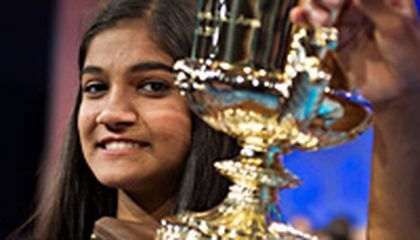 Then it was Gokul's turn, and the 14-year-old from Chesterfield, Missouri, was told that one of two things would happen, that he could get the word right and be a co-champion, or he could get it wrong and Vanya would win. The word was "nunatak" and Gokul didn't even bother to ask the definition before spelling it. For the record, it means a hill or mountain completely surrounded by glacial ice. "I knew it right away," he said, "I didn't want to keep everyone waiting." Like many spellers, Vanya went through a routine, asking for the definition and the language of origin, confirming the roots and pretending to write the word down before spelling. Gokul didn't ask many questions and he chugged through the letters like he had dinner plans. The winners don't have to worry about spelling anymore, but Kimble is left to ponder a future when the toughest words still aren't tough enough. Wow what an amazing feat! To think these 13 and 14 year old kids can spell and remember words I have never herd and have no hope of ever pronouncing correctly. These students are true prodigies, each with there own dream equally suited for their great accomplishments. It must be interesting to follow what they go on to do after their time competing is over. Each and every competitor has already beat me out times a thousand just for entering, kudos to them! I never realized that these spelling bees where becoming such a popular event. Perhaps I'm blinded in my own ignorance of what popular now, otherwise i would have entered in one of these events much sooner. I'm sure these competitions would be extremely beneficial to my vocabulary, and allow me to expand my mind. Perhaps i should attempt to start a small spelling bee at my school. I suppose it's almost weird not to have one available here. The achievement these guys have reached is nothing short of incredible. The only thing I was wondering: why are none of those crazy medical terms in the list of championship level words? 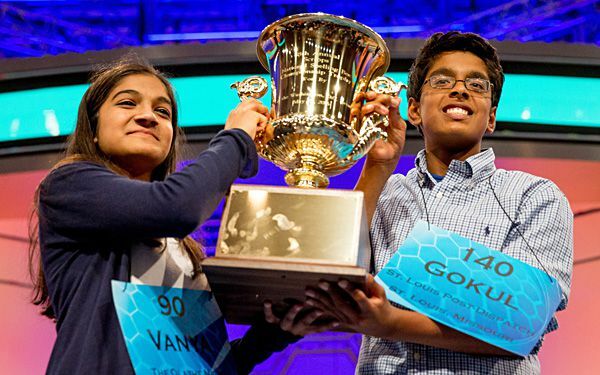 Vanya and Gokul are crazy smart! I would never be able to spell any of the words they did, let alone, know what they mean! It is also so incredible that they are only 13 and 14! I bet that many adults probably didn't even know half of the words they did! They are definitely true prodigies. When I first saw that this year's spelling bee ended with a tie, I was surprised. I figured that they would have kept going. until a winner occurred. But then again, last year's had the same outcome: a tie. At Newport, we go until a winner is achieved or until the last bell rings. However, ever since I can remember, we have always had a winner. spellers get better each year because after the first competition they go home a get ready for the next by practicing and getting better for the next year. Its nice that some kids like to go to spelling bee's and participate. Some kids don't have a choice and there parents want them to do something that they don't want to do. Some kids could actually be a part of something that they really like to do. They could win trophies and get prices for being smart and remembering and learning a lot of words.